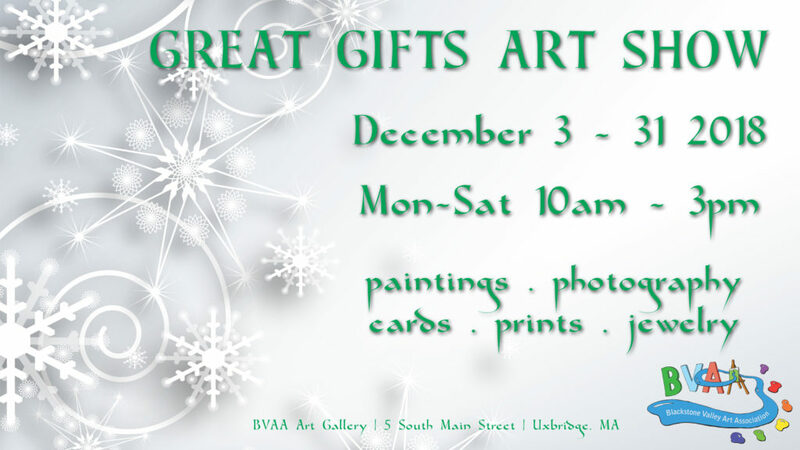 The Blackstone Valley Art Association is showcasing a delightful selection of photography, watercolors, acrylic paintings, oil paintings, jewelry, and more for the month of December 2018. Be sure to stop by and see what we have available! Perfect for gift giving! This show is open to BVAA members only. The theme is wide open. Any topic can be addressed as long as it is family-friendly. Artwork can be any size. That being said, please contact us first if you plan on bringing anything over 20″ x 30″ in size. We need to arrange for space for those separately. To submit your entries use our BVAA Online Submission Form. This show is free to participate in. Each artist may submit up to five items under 11×17 or up to three items if they’re 11×17 or larger. We are doing a rolling drop-off for this show since it’s coming so quickly after our Tapestry show. Lisa will be at the gallery on Monday, Dec 3rd and Tue, Dec 4th from 6-8pm. We’ll be hanging the items on Wednesday, Dec 5th probably around 4pm. If you had items in the Tapestry show you’d like to just carry over into this show, fill in the form so we know that and we’ll re-use them. If you want to bring in fresh items, that’s fine too. If you’re not able to make it in until Thursday night (Carol Arnold has a class from 6-9 so the gallery will be open) or Saturday 10-3, that’s also fine. We’ll find spots to put up your items. Just please do use the online form so we can make up labels. All work which is brought in will be hung (as long as it is properly wired and is family-friendly). The opening reception will be during our annual holiday pot luck on Tuesday, December 18th, 2018 from 6:30-9pm. Each member can bring one guest, and there is a charge for the catering meal. We need an RSVP for that – BVAA Holiday Party. For those who want to come see the show and hang out for a little while, the public portion of the meeting is from 6pm to 7pm. Feel free to come in during that time period to talk with artists and see the artwork. The pick-up for the Great Gifts show will be casual. We don’t start the next show, our open photography show, until mid-January. So we have some breathing room. Feel free to come by Saturday Jan 5th or Sat Jan 12th during our normal 10am to 3pm hours to get your art. You could also come by Thu Jan 3rd during Carol Arnold’s oil painting class, as we’ll have the gallery open then. Just check ahead if you want to do that, as sometimes we cancel her class if we don’t have enough students. Ask with any questions! We look forward to seeing your entries!